The pinball table will feature 15 game modes based on episodes from the show. Zen Pinball company Zen Studios has announced the upcoming release of Bob’s Burgers Pinball on mobile devices, home consoles and PC. The table is based on the popular FOX animated television series Bob’s Burgers, which follows the adventures of the Belcher family as they run their family restaurant. 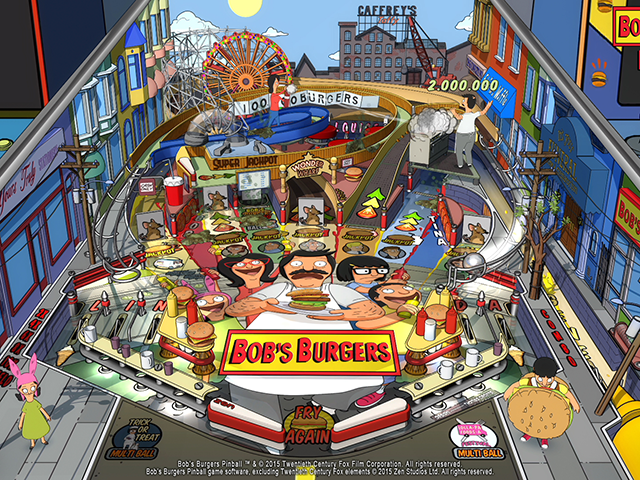 As with other branded Zen Pinball tables, like those based on Portal or Telltale’s The Walking Dead (as examples), the Bob’s Burgers table will feature voice acting from the show’s characters, who are positioned around the outside of the table itself. The title will include 15 different game modes with goals to complete based on episodes from the show. On console and PC, the Bob’s Burgers table will be available as part of the ‘Balls of Glory’ DLC pack, which will also offer a table based on another FOX television series: Family Guy. On mobile, however, both tables will be available as standalone premium apps, and as DLC within the Zen Pinball mobile app. The Bob’s Burgers Pinball and Family Guy Pinball tables will launch this fall on the iTunes App Store, Google Play and Amazon Appstore. Check back soon for more.